Long time no blog right? Well, anytime I'm gone from blogging for awhile, it usually means I'm researching something (or I'm busy)...and while I have been busy, I have also been researching and this time my research topic is sleep. Not quite the greenest of topics, but it's pretty fundamental to our health. I mean, there's no point in drinking green juice and hoping for some miracles, if you're clocking 3 hours of sleep each night. 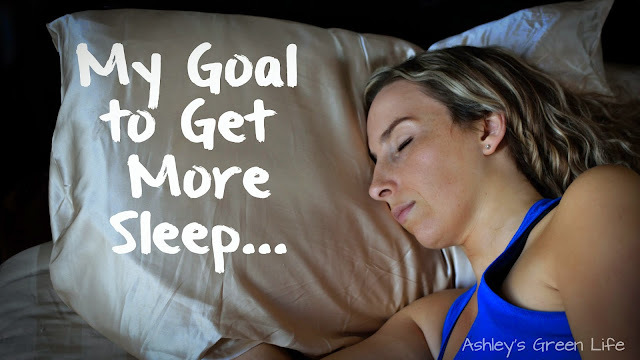 Now as the title of this post states, I recently set a goal for myself to get more sleep and I want to recommend that you give a try too. I always find it interesting to hear what people I look up to are "working on" or what goals they have set for themselves. I think, "Wow, despite all they've done and are good at, they are still trying to get better...well what are they working on?" To me, it makes them feel more real. So that's what I've got for you today, something "real" that I've been working on. Now I'm no Kris Carr or Oprah, but with all the green tips I'm always sharing, you might come to think that I've got it all figured out or that I've got this healthy life thing down...but the truth is I'm always learning and always striving to be better. And one area that I am working towards doing better in is with my sleep. In peeling back the ominous curtain of "I've got it all together" I hope you can relate to what I'm going through and we can get through it together. So what spurred me to set my new goal of getting more sleep? 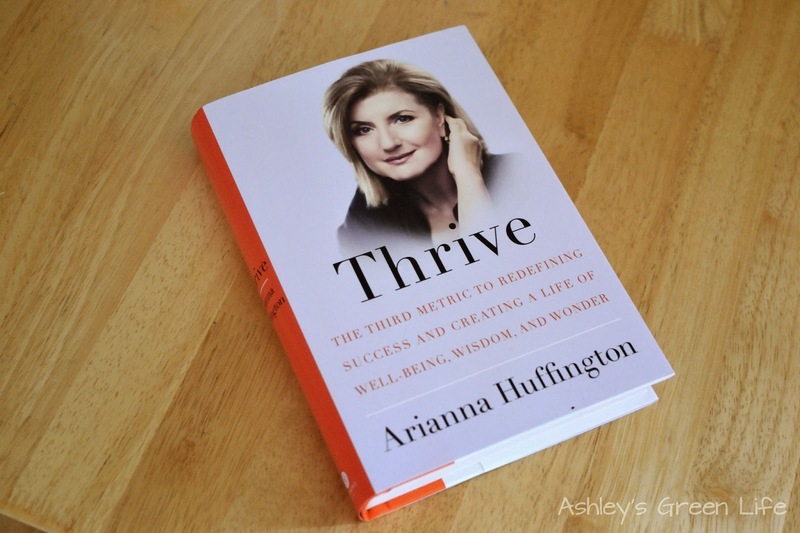 I recently read the book, Thrive: The Third Metric to Redefining Success and Creating a Life of Well-Being, Wisdom, and Wonder by Arianna Huffington, and it changed my life...seriously. If you haven't read it yet, drop what you're reading currently and get a copy of that book. I could write tons of posts about all the topics and tips discussed in this book that I've started incorporating into my life, but the one I think that others can identify with the most and the one I've put the most work and effort into doing more of is to GET MORE SLEEP. In the book Arianna describes how we're often given mixed messages from society. On one hand we're told to give 110% in everything we do, to work more and sleep less, and to always go that extra mile...no matter what it takes. But realistically when we live by that motto and push ourselves too hard, we end up exhausted, lacking creativity and energy, and eventually burning out. Can you relate to the feeling of always striving to be more successful, no matter what the cost? I know I can. Because like most women, I'm trying to do it all. 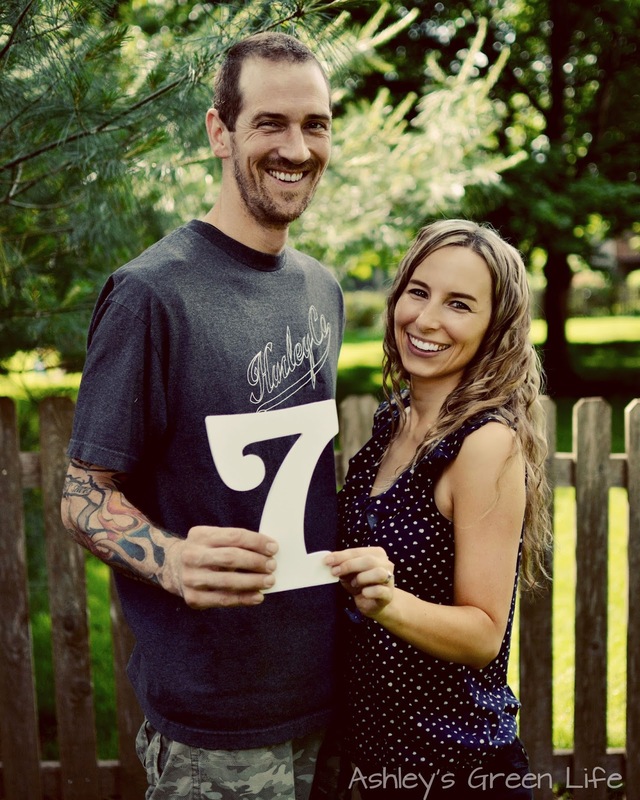 I work full time as a special education preschool teacher, I have two daughters, one is 3 years old and the other 6 months old, and I have my blog and YouTube channel. There's days where I literally schedule in as much as I possibly can into every minute of every hour, rarely giving myself a chance to breathe. Multitasking was my middle name and in spare second I had I felt I had to fill with something so I could cross it off my never-ending to-do list. A few minutes while dinner is cooking? Better sort the laundry. A few minutes before Avery and Mila wake up? Better try to edit some pictures for a blog post. While driving to work each day, I oil pull and listen to motivational tips on how to increase my success, during my lunch break I prepare lesson plans and brainstorm blog post ideas, before bed I prepare my things for the next day. Can you tell I have a hard time doing nothing? So to think of going to bed at an earlier time than my average 10:30 PM or so and that was wasted time! Time I could have spent working on a blog post, time I could have spent watching something on DVR, time I could have spent "relaxing" from all my multitasking. The funny thing is, I was never very productive at that time. Sometimes I'd sit down to make the grocery list for the next week only to find that while trying to watch an episode of Parenthood and do the grocery list, I took 45 minutes just to write 10 things on the list. Or when I'd go to write a blog post, I'd stare at a blank screen searching for creativity and words to strike, but they would not come to me. In fact, I began to sort of dread writing a post because I did not feel the creative urge to write. Looking back, my body and my mind were so exhausted that they were unable to do anything but mindlessly watch something on TV (not that there's anything wrong with that from time to time). And as you can tell by the length of this post, my urge to write has returned as well...probably because I'm not relying on it to come to me at 10:15 PM. That's when I really started to consider this idea of getting more sleep. Also hearing from someone as successful like Arianna, really gave me the "okay" to say YES to an earlier bedtime, and NO to one more thing on my to-do list. As I said before, I was currently getting about 6 hours or so a night, sometimes a little more, sometimes a little less. I would usually go to bed around 10:00-10:30 PM, and then wake up at 4:40 AM so I could workout, get myself and my girls all packed and ready for the day. Now back then I thought I was getting a decent amount of sleep. I thought I remember hearing 7-8 is ideal, but that some people need more and some need less. I just figured I was one of those "less" people, and 6 was my number. The thing I didn't think about was...how did 6 hours of sleep make me feel? The answer: tired! I'd usually be fine in the morning, but in the afternoon I would get hit with strong fatigue after lunch, again when I got home from work, and then again during what should have been my bedtime (that I often ignored). I also had shorter workouts, snacked more, always seemed on the verge of catching a cold, was less patient with those around me, and constantly thought about and plotted how I could get to bed ASAP. So with this in mind I figured, the goal of getting more sleep might not be a bad idea. It also helped that I was learning some of the negative side effects that come from being chronically sleep deprived, such as being more prone to illness, stress, traffic accidents, and weight gain. And over time chronic sleep deprivation can even lead to heart disease, diabetes, and certain cancers. In the book Arianna suggests that a way you can easy yourself into getting more sleep is to start by just getting 30 more minutes of sleep than you are currently getting now. So like a little kid braving the swimming pool for the first time, I agreed to try that, to just get my feet wet a little bit. So I moved my time to 10:00 PM. Then feeling courageous, and because I heard her say she personally gets 7-8 hours of sleep at night, I thought "What if I just went to bed at 9:40? That would give me a full 7 seven hours...kind of like her." So I tried it, and I liked it. No blogging, no working...just sleeping. It wasn't always easy to stick to. Those last 15-20 minutes before my "curfew" were a bit rushed in the beginning and it really led me to reevaluate some of the time our family has in the evening. Getting me to bed earlier, meant getting the girls to bed earlier, which meant eating dinner earlier, you get the idea. But the feeling I had of waking up and knowing my body got 7 hours of sleep, compared to it's usual 6 or less, was very gratifying. Over time I started to notice as I result of getting more sleep I was getting sick less often, I felt calmer and more patient. I had more energy for my workouts and I made better food choices. Overall I just felt happier. Then after a few weeks of that and more sleep research I came to find the consistent and recommended number was 8. That's right, 8 hours of sleep. Whew, I knew it wouldn't be easy, but when you read the benefits that come from getting more sleep and the risks you avoid by getting 8 hours of sleep it starts to look pretty convincing. So being the overachiever that I am, I tried pushing my curfew back even more to 8:40. Seriously folks this felt crazy. It seemed so early. But when I would wake up in the morning, I would feel awesome. The only problem with this super early bedtime was that it wasn't always possible to get that full 8 hours. Things would come up like Mila waking up multiple times a night, not meeting my 8:40 curfew, or just some restless thought running through my head (like how in the world can I sum up all this sleep info in one post without it reaching novel proportions?). When these things would come up, I'd get upset that I wasn't getting my full 8 hours and that would make me mad. I sound like a toddler, but seriously, I would think, "Come on, I know how important sleep is now, let me get some freaking sleep!" "Come on guys! It's time for bed!" So, in giving myself some grace, which I recommend you do as well, I've settled on 7.5 hours which puts me going to bed around 9:10 PM. Still earlier than my old bedtime, but not so early that I have to work so stinking hard to do it. All in all I like to shoot for 8:40 PM as a goal each night but as long as I'm in bed before 9:40, I consider it a job well done. 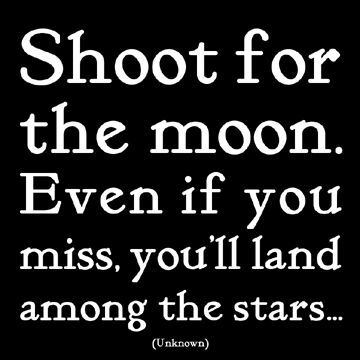 Ever heard the quote, "Shoot for the moon, even if you miss you'll land among the stars"? Well, 8:40 is my moon and if I make it there, great. If not, falling between there and 9:40 is straight up star-worthy. 1. Sleep is the elephant in the room! 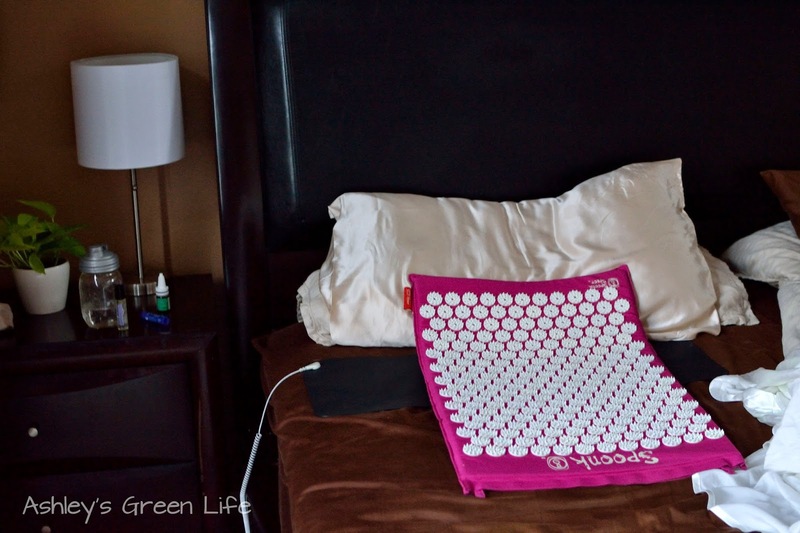 It's almost comical to me that I spend so much money and time on supplements, vitamins, green juice, exercise, and crazy alternative gadgets like Spoonking, Earthing mats, tongue scraping, dry skin brushing, oil pulling and rebounding...only to pay no attention to one critical area: sleep! 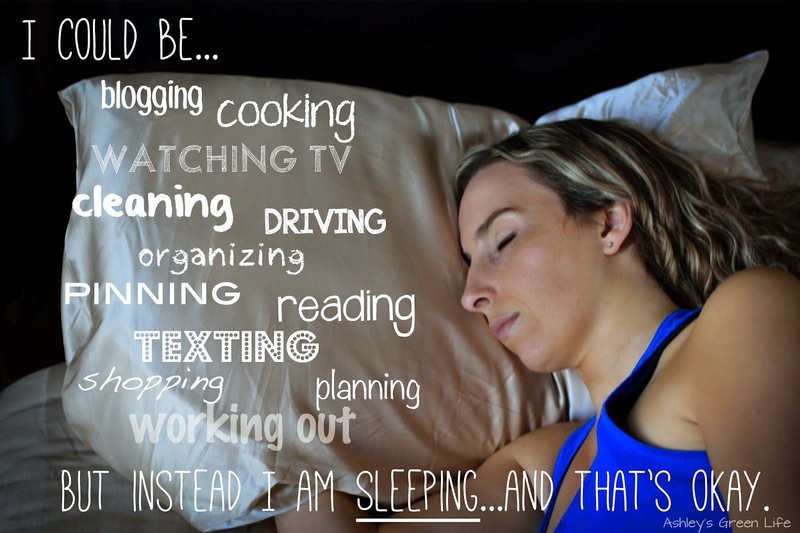 When things ever got busy in my life the first thing I gladly dropped down on the priority list was sleep. But until now I never saw that this was such an injustice to me and my health, I saw it as one more thing on my to-do list that could be moved around, and shortened if needed. Now I know better and I know that I can actually improve my health by sleeping more (shocker, I know). 2. What's the point of being successful if you are too exhausted to enjoy it? In my sleep deprived days I would hit "Publish" on a blog post only to be filled with a sense of "Whew...I'm glad that's over!" Seriously? 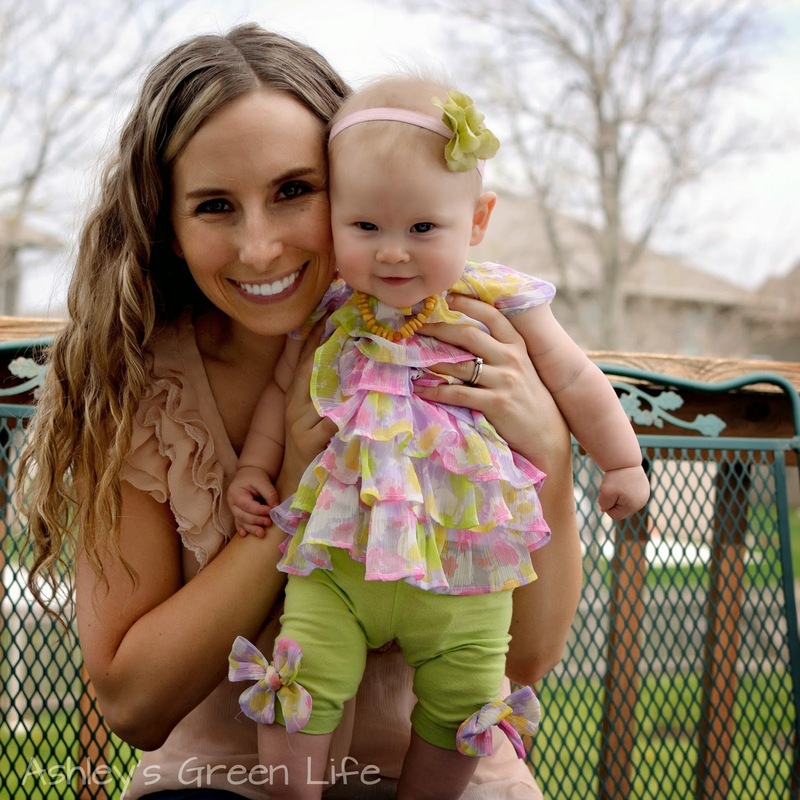 I started this blog as a passion project, something I could do to get the word out about my crazy, green way of life that would inspire others to be green too..this is supposed to be fun for me, but it wasn't. And this is because I was attempting to do it on an empty well with no sleep, no creativity, and no real drive but to write it, post it and be done with it. But what's the point in that? On top of that what kind of mother was I being for my children? What type of teacher in the classroom? When sleep deprived all these things that make up me were operating at 60-70% of their full potential. Kind of like a "watered down Ashley." Sort of like the real thing, but not quite. When I get more sleep, my tank is full. I operate at 95-100% and I have the energy, the patience, the love to be my true self. Not the me bogged down by exhaustion, cravings for chips, and a crazy tense neck and shoulders. 3. It doesn't make you lazy for going to sleep early, it makes you smarter...literally. Not doing one more task after I put my girls to sleep each night was hard for me. But instead of trying to work when I was exhausted, I rearranged my work time to other times when I was more awake, alert, and creative. So instead of approaching a post, recipe, or even just an activity with my kids from a frazzled, tired, cranky point...I instead came to the table with a fresh mind, an energetic body, and much more patience. Here's a visual I made to help remind me that it's okay for me to go to sleep, maybe you can relate. Now if you are parent, I know what you might be thinking... That's all good and nice to get more sleep, but look, I have kids that keep me up all night, how am I supposed to get 8 hours with that?!!!" Okay, I'm with you. I'm not saying this "goal to get more sleep" is a walk in the park, it's not. Kids an a lovely surprise element to the sleep game in how they can and probably will disrupt it in someway. For me, my 3 year old is pretty good and sleeping through the night, but Mila, my seven-month-old, is my wildcard. She varies in the amount of sleep she gets every night. Some nights I'll be up nursing her just once, other times I'll be up two or three times, and she then she'll refuse to go back to sleep. Grrr. As a parent it is really hard to know all the benefits that come from getting more sleep, but when your children keep you from getting it, things get rough, and if you're like me, you feel helpless and as though you have to commit to just having "crappy sleep" for the next 18 or so years. But there are some things you can do. 1. Set the odds in your favor. We may not be able to control if and when our kids wake us up at night, but we can control when we go to bed and when we wake up. Although it doesn't happen every night I try to set my sleeping time/amount so that even if I have to get up three times to get Mila, I'll still end up getting a decent amount of sleep. Now if I don't end up using it, that's a bonus=more sleep for me! For example, Mila and Avery are usually both asleep by 8:30 PM, and from then I can choose if I want to go to bed at 9:00 or 10:30, or somewhere in between. 2. Take naps if you can. 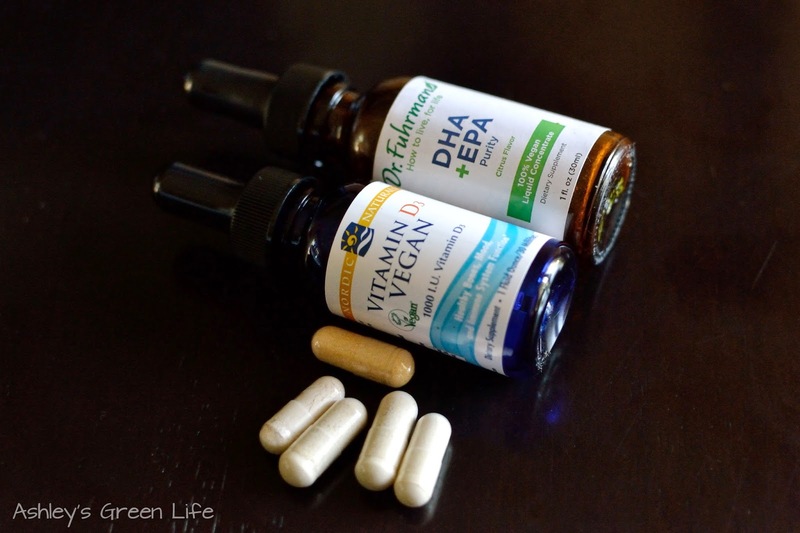 I'll share more about this in an upcoming post, but this has been my saving grace to recover from the long nights where I didn't get as much sleep (due to my kiddos) than I would have liked to get. A 20 minute nap mid-day, or when my kids take a nap (if some how the stars align and they sleep at the same time), always helps me feel more rested. 3. Get some help from your partner. Sharing childcare duty at night can be helpful for parents (if possible) because it takes all the burden, and sleep deprivation off one person and instead becomes a shared duty. I know once I've nursed Mila and she still just refuses to go back to sleep, I come back into our bedroom and let my hubby know it's time for him to go work his magic (he has some mad sleep-rocking skills). You could also utilize your partner to allow you to take a nap, even if this means you have to wait until they get home from work, 20 minutes of rest may be just what you need to get through the rest of the day/evening without collapsing from exhaustion first. until we had kids. I couldn't do it without him. So there you have it, my goal to get more sleep. Sorry if I bored you with all the details of my sleep schedule and challenges, but I hope some of you can relate to it. I know that reading the book Thrive and rediscovering the way I prioritize sleep was a big light bulb moment for me, and it gave me the proof, evidence, and social "okay" to really be okay with getting more of it. So please share below, what is your sleep like? Do you wish you got more? 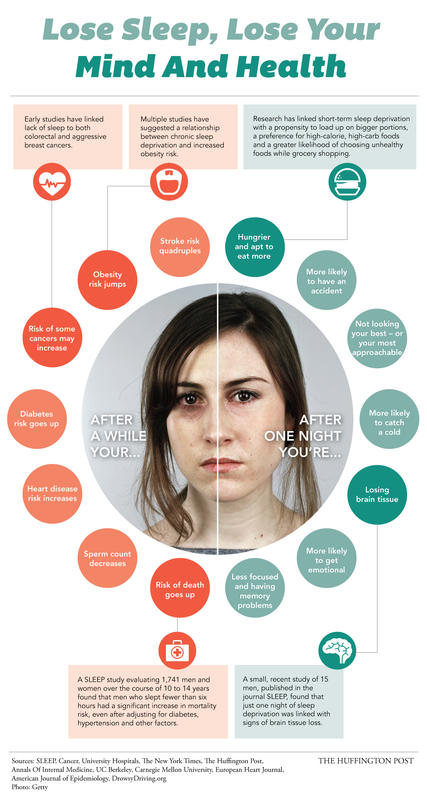 What steps could you take to get more sleep? If you have started sleeping more, what benefits do you notice? Now I know for some of you that sleep doesn't come easy. 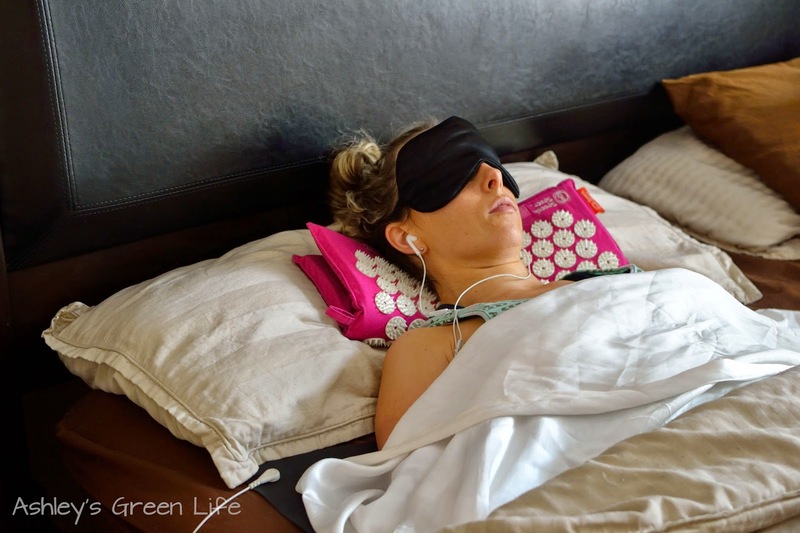 I've felt this from time to time, so stay tuned for my next post where I share my "Top 10 Unique Tips for Better Sleep" because as crazy "green" as my life is, you know I've got some rockin' tips to share that you might not have heard about before. Unique Tips for Better Sleep." Soon to come as well is another post about sleep and that's about "How & Why I Take a Nap Daily" another new habit I started to support my goal of getting more sleep. Napping it up...and why you should too...is coming soon! Loved this piece! As a parent, it really is hard to stop and take time for yourself, especially extra sleep. I can't wait to read your additional posts about this topic. Great post! Sleep is so necessary... I've never understood people who claim that they can get away with 6 hours of sleep. I need 8-9!